Besan chilla pizza recipe with step by step photos. Adding one more easy to make tasty recipe to my pizza recipes collection. I got some requests for gluten free pizza recipe when I shared my easy skillet pizza recipe. I never thought of making a gluten free pizza till then. I know few gluten free pizza like the ones with cauliflower crust, potato crust etc but I was not very confident to try them. To make besan chilla pizza recipe or gluten free pizza recipe, we need just 3 main ingredients for the crust. Besan flour, salt and water. You can further flavor the crust as you wish. I added some chili flakes, pepper powder and minced garlic to the batter. You can make a proper Indian besan chilla and make pizza too. I have kept the toppings also simple, just cubed bell peppers and paneer as I had only them handy. I also had 2 baby corns so added that too. 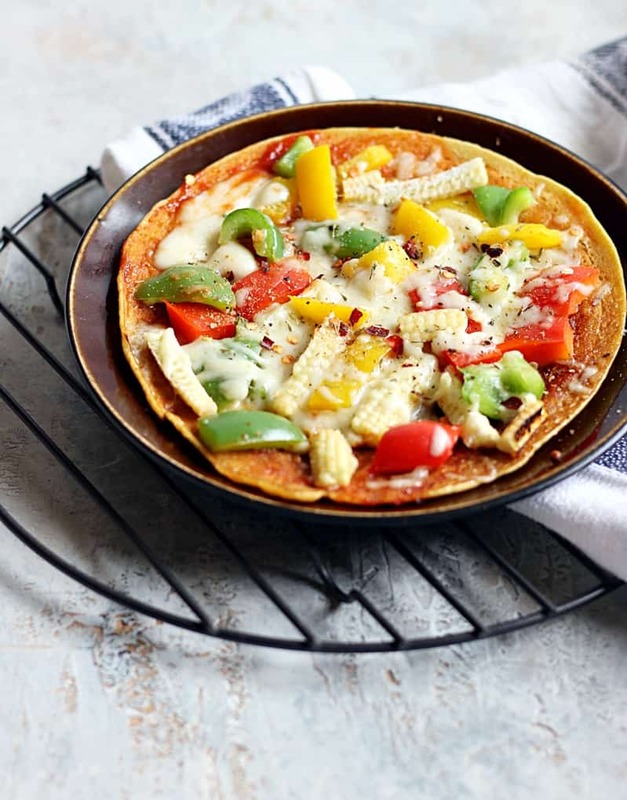 Serve besan chilla pizza hot as soon as it is made. Wonderful healthy snack/meal for toddlers and kids. 1. Take 1/2 cup besan flour / gram flour/ kadalai mavu in a mixing bowl. Add salt, chili flakes, minced garlic, pepper powder and mix well. Add water gradually and make lump free batter. The consistency should be slightly thin than idli batter. 2. Keep the desired toppings, sauce, seasoning and grated cheese ready for topping the pizza. 3. Heat a heavy cast iron tava. Once the tava is hot, maintain medium flame and pour a ladle full of prepared besan chilla batter. Spread it a make a thin circle. You can make a thick base if you wish. Let the chilla cook for 2- minutes. 4. Lower the flame and flip the chilla. Quickly spread the pizza sauce and arrange the toppings. Add seasoning, grated cheese and press gently. Drizle some olive oil over the cheese and also around the edges of the pizza. Cover and cook in low flame till the cheese melts. Serve besan chilla pizza hot sliced into wedges. Keep the desired toppings, sauce, seasoning and grated cheese ready for topping the pizza. Heat a heavy cast iron tava. Once the tava is hot, maintain medium flame and pour a ladle full of prepared besan chilla batter. Spread it a make a thin circle. You can make a thick base if you wish. Let the chilla cook for 2- minutes. Lower the flame and flip the chilla. Quickly spread the pizza sauce and arrange the toppings. Add seasoning, grated cheese and press gently. Drizle some olive oil over the cheese and also around the edges of the pizza. Cover and cook in low flame till the cheese melts. Serve besan chilla pizza hot sliced into wedges.